MI6 reviews Titan Books' newly reissued graphic novel "James Bond 007: The Man With the Golden Gun" written by Ian Fleming, James Lawrence and Yaroslav Horak. In the early 60's James Bond was everywhere, including national tabloids and broadsheets. Titan Books have republished the original 1987, 80 page classic "The Man with the Golden Gun". These uniquely structured comic strips saw Bond fighting his foes everyday in only then three panels. Each strip was carefully crafted to communicate Location, Plot and Character development to the reader. Today sees the launch of the revised Jim Lawrence and Yaroslav Horak original graphic novel based on Ian Fleming's 13th Bond novel first published in 1965. The first re-issue boasts new cover art which is a reworked cell from panel 797 of the earlier 1967 adaptation of "The Spy Who Loves Me". The revised version of the graphic novel is introduced by Fleming's niece, Lucy Fleming, in which she talks about her personal experiences with Fleming with fondness, and tales of sneaking peeks at the novels. Above: Cells from "The Man with the Golden Gun"
A brief biography about Ian Fleming focusing on his war efforts, and the grounding for his world famous spy James Bond and their personal connections is described with insight by Paul Simpson. Simpson continues highlighting Fleming's loves and Bond's first comic strip incarnation in 1958 "Casino Royale" published by the 'Daily Express'. Above: Cell from "The Living Daylights"
A brief look at the duo behind the 'Express' comic strip Jim Lawrence and Yaroslav Horak. Starting with a description of how each of them got started, Horak moving away from his native China and Lawrence humble beginnings as a technical script writer for the US Armed Forces. They paired up in London and begun one of the most successful runs of Bond in this new format. The piece concludes by reflection on the trust Fleming felt Lawrence and Horak allowing them to create original comic strip Bond outings. To convert the literary Bond to Comic strip formatting required story line alterations on the part of Lawrence. He creates a new dynamic subplot about Bond's fellow patient at 'The Park' and adds a new Bond girl 'Taj' Mahal. The story picks up from where Bond's brain washing from "You Only Live Twice" leads him back to MI6. The contemporary styled panels depict Bonds adventure over 209 daily strips which ran from 10/1/66 - 10/9/66. 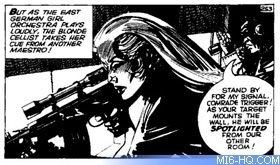 Also included are 56 strips that make up Fleming's short story 'The Living Daylights' adapted by Jim Lawrence and illustrations by Yaroslav Horak, which ran from 12/9/66 to 12/11/66 in the 'Express'. Rounding off this first reissue is a checklist of every Bond newspaper strip including dates of print and reference numbers in a table format. Above: Cell from "The Man with the Golden Gun"
Summary: "The Man With The Golden Gun " is the first in a revised and re-issued series of classic Fleming Bond adventures. With such care being put into the re-issue this will hopefully set the standard for the remaining Titian's Bond titles. 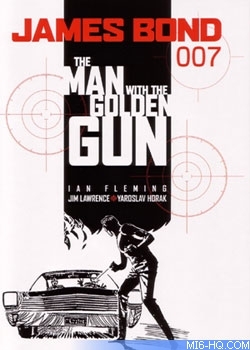 However, the feature on the authors could have been expanded, with further discussion on how their concept of Fleming's Bond was brought to life by the artwork.